The Cloud Credentials page lists cloud service access keys that are stored for the cluster. The cluster uses these credentials to access cloud core filers. Note that this interface only stores credentials for the cluster to use; you must create the credential with your cloud provider’s tools before defining it here. The process for creating credentials varies by provider, but it typically involves creating a user with the appropriate cloud access privileges, then copying the user’s key ID and secret key. Enter that information in this settings page to store the credential for the Avere cluster’s use. 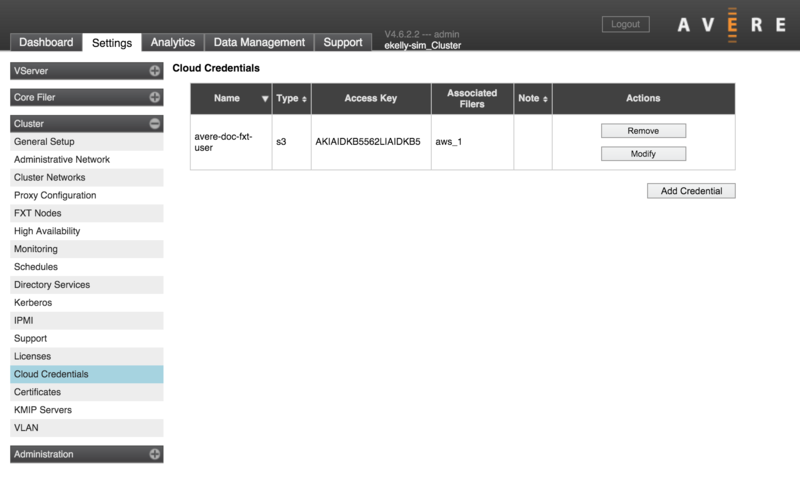 Click the Add Credential button to bring up the form for storing a new cloud credential. Enter a name to use when displaying this credential in the Avere Control Panel. Select the cloud provider or credential format for this entry. Different credential options appear for different service types. The access key/private key options below are used for AWS S3 style credentials, but other service types might require you to specify different attributes. Enter the access key used with your cloud provider. Note that the access key and the private key are a matched pair; if you change one you must change the other one. Enter the private key used with your cloud provider. Note that the access key and the private key are a matched pair; if you change one you must change the other one. Optionally, add a text note about this credential. Remember to click Submit to save the values. Click the Modify button in the Actions column to update the credential listed in that row. The Modify Credential form includes the same settings as the Create form, but also shows any core filers that use the credential. Consider the possible effects on core filers before submitting changes. To remove a cloud service key from the cluster, locate it in the list and click the Remove button in its Actions column. You cannot remove a cloud credential that is in use. Note that this interface does not destroy the key set; it only deletes it from the cluster’s list of stored credentials. The key set still exists on the cloud system.